If you’ve lost numerous teeth, it’s likely you’re feeling pretty hopeless. Let the Jacksonville Dental Specialists help you find some new reasons to smile. We understand how difficult extensive tooth loss can be, and we want to provide the support our patients need to make complete recoveries. We offer a variety of tooth replacement solutions, including the gold standard dental implant supported partial and full dentures that allow our patients to speak, chew, and smile with total confidence – no matter how many teeth are lost. When you’re ready to get started rebuilding your smile, call our dental office in Jacksonville to schedule a tooth replacement consultation with one of our skilled specialists. 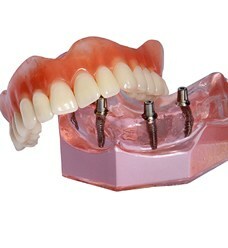 An implant-retained partial or full denture will look much like a traditional, removable prosthetic before we place it. A gum-colored base material is used to support numerous replacement teeth. Traditional partials fit between healthy teeth and are supported by clasps attached to the remaining natural tooth structure. Traditional full dentures rely on suction between the denture and gums and/or denture adhesive for support. Implant supported partial and full dentures allow us to offer an alternative that improves both the stability and longevity of your prosthetic. A partial denture can usually be supported with just two to four implant posts, and a full denture is typically anchored to between four and six dental implants. Many patients aren’t quite ready to toss out their existing denture, or they don’t like the idea of not being able to remove their denture. There’s an effective dental implant-supported solution for these patients as well! Hybrid dental implant dentures use removable attachment pieces to allow patients to place and remove their dentures independently. In many cases, we can even use an existing denture that is relined and fitted to attach to implant posts. This often provides a more affordable option for patients, and for those who have difficulty with dexterity, a removable partial or full denture can be much easier to keep clean. Plus, you’ll have all the added stability and longevity associated with traditional implant-fixed dentures. This is an innovative dental implant supported denture technique that allows us to offer implant supported dentures for more patients than ever before. 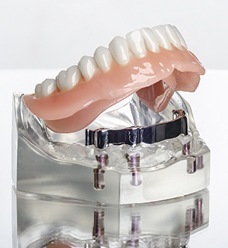 All-on-4 dentures take advantage of the naturally denser parts of the jaw to support a full denture. Two implants will be placed vertically to support the front parts of the denture. The other two implant posts are positioned diagonally from the back of the mouth to implant into the front of the jawbone. This provides support for the whole denture without the need for costly and invasive bone and gum tissue grafts that may otherwise be necessary. For this reason, All-on-4 makes it possible for almost any patient to successfully receive dental implant supported denture treatment.